Travel Alarm Clock Reviews – When traveling, I like to have a real travel alarm clock nearby – not an iPhone or a digital watch. I usually bring a travel alarm clock with me on my trips. Why? I like the reliability of my own clock. I would rather not worry about not setting the hotel’s travel alarm clock correctly and missing my flight or meeting. Do you remember the days of calling the hotel’s front desk and asking for a wake up call at a certain time? For better or for worse, those days are long gone! Depending on what type of travel alarm clock you’re looking for, there many choices. What makes a clock the best travel clock? Simply, it’s one that you will want to use as much as home as you do on the road. It will become part of your morning routine. This clock is often unavailable on Amazon but it’s our favorite. For our family, it’s the best alarm clock, hands down. 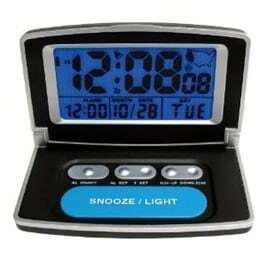 It’s the Westclox NYL47538 LCD Digital Bedside Alarm Clock. Through the years, we have purchased four of these because we love them so much. My kids also use them, and even bring them on vacations and sleepovers. It’s technically a “bedside” and not a “travel” clock, but it packs easily and is light. What we love best is the big button to light the screen. It’s great to check the time in the middle of the night. It’s very easy to set the time and the alarm. We like sleeping in total darkness and like that this clock doesn’t illuminate in any way unless you press the Light button. 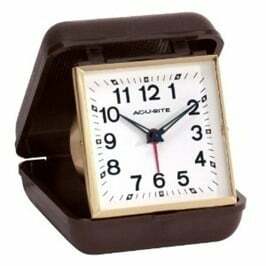 Some many not like that it doesn’t fold; however, when we’ve had folding alarm clocks in the past, they’ve often broke. We’ve dropped the Westclox by mistake a few times, and it was fine. The Westclox measures 3″W x 3″D x 2.5″H. It has a sturdy base and takes two AAA batteries. This Elgin Travel Alarm clock is the best in the category of most basic travel alarm clock. It has a four minute snooze with an indigo backlight. It measures 4” by 5” and requires 1 AA battery for operation. The Casio Travel Alarm clock comes with a thermometer. It also has a 5 minute snooze and requires 2 AAA batteries. It has a blue backlit face and features the day and date, great for when you’re on the road. If you’re looking for an alarm clock with the date like the Casio, this Sharp travel alarm clock might be just want you want. It has a huge snooze button, backlit. It’s ultra-thin and folds up to be the size of a cell phone. You can get this Seiko “get up and glow” alarm clock. It’s easy to set and easy to operate. The snooze/light button is large. It uses a AAA battery and has the date on the face. The Oregon Scientific atomic travel alarm clock is a little unusual looking. Perhaps more modern than most alarm clocks. It has a crescendo alarm that gradually gets louder (in case you’re a sound sleeper). We like the 8-minute snooze. My kids like that you can use the projection setting to continuously project or momentarily project the time onto the ceiling. It’s an atomic clock that automatically updates the time. This Sony alarm clock automatically updates the time. It has a dual alarm. You can adjust the brightness of the display. It has a radio and measures about 7” by 3.5”. Seiko, known for superior atomic clocks, comes with a three year warranty and is backed by the Seiko brand. Besides automatically updating the time, the display is clear and the date/day functions are helpful. Just want a good old fashioned analog travel alarm clock? This 3×3” folds-into-a-box analog alarm clock is your best bet. It’s worth getting a travel clock. You will use it for quick overnight trips. My one son even brings his Westclok into the living room each day to manage our time before school. You will probably use it much more often than you expect. It isn’t expensive to invest in a decent travel alarm clock, and the peace of mind you will have knowing you will be able to wake up on time is worth it. You will probably sleep better too! Personally, I cannot go to sleep in a hotel room without being in sight of a clock, but I also can’t always plug my smart phone in close by. This little water-powered clock doesn’t need an outlet, and is so lightweight, you’ll barely know you’ve packed it. The device tells time by harvesting energy from the salted water you fill it with to fuel the simple LCD screen. When a friend of mine told me they were looking for a small travel alarm clock to take with them on a backpacking trip my first thought was Why? When I go away I rely on my phone to get me up in the morning, so could not understand why they wanted a physical travel clock. It turns out they had several good reasons why they needed a physical clock rather than relying on a phone app to get them up with the larks. The easiest way to cover these reasons is to take a look at the different types of travel clocks that are available and how they benefit certain groups of travelers. For those travelling in remote spots power can be a huge issue. But not with a Solar Powered Travel Alarm Clock! There just is not anywhere to charge a phone, so relying on an alarm phone app to keep track of time and get you up is just not an option. In this situation, a compact solar or dual powered clock with a built in alarm is an ideal option. The best ones have a range of light settings to help you to conserve power. If your clocks charge levels are low you can opt for the screen to be black and to see the time you hit a button. On the other hand, if the day has been sunny and the clock is fully charged you can opt to have the time show all of the time. For some people the volume on their phone’s alarm app just is not high enough to get them up. My dad was a night worker, and a heavy sleeper. To get up he had to rig a doorbell with the button taped down to a timer downstairs to make sure he heard it. The fact he had to get up and go downstairs to turn it off ensured he actually got up. I can tell you that alarm was loud, but if he did not get up because he simply did not hear an ordinary alarm clock. Judging by the number of extra loud travel alarm clocks there are out there it seems my dad is not alone. My personal favorite is aptly named the Sonic Boom Alarm Clock. It is not a travel clock as such, but is a practical option for those who are travelling and need an extra loud alarm to ensure they do not miss their flight. My favorite kind of alarm clock is the folding type. I know, I know having a favorite type of alarm clock is a bit sad, but I can remember my granny coming to stay and bringing hers with her, so they bring back good memories. As a kid it fascinated me that it was so small when folded, and the fact that the hands and numbers glowed in the dark really helped. It was like something an alien should own. While we are on the subject of travel clocks that do not take up a lot of space, how about miniature alarm clocks. There are plenty of really small alarm clocks out there, but they are a bit bland. I have found some nice miniature clocks that have a simple alarm feature built in, which would be a good alternative to a plastic clock. Just be careful not to buy one that gets lost in your suitcase. If like me you are used to sleeping with a projection clock& it can be weird waking up in the night looking at the ceiling to check the time only to find it is not there. Unfortunately, my home projection clock is too big to travel with. However, I have found a viable alternative in the XREXS projector clock. It is quite compact and has an easy way to adjust the angle of the projector and thus adapt it to any room configuration. Importantly, it runs on batteries, so there is no bulky lead and plug to find suitcase space for, and no need to pack an additional travel plug when taking it abroad. Most travel alarm clocks are analog rather than digital. They are great because they take up less space and use less battery power, but there is a big issue with analog clocks and it is that they tick. If you are not used to the sound of a ticking clock I guarantee that it will drive you nuts and may even keep you awake. This is clearly something that the manufacturers of alarm clocks have realized, which is why they now sell non-ticking travel clocks. One of the best is the Timelink 88659, which also has built in brightness control. So, if you are tired of waking up in the night, disorientated, in a strange hotel room, not knowing what the time is, fumbling around and knocking your mobile phone onto a hard tile floor . Go old school and buy yourself a snazzy new travel alarm clock. As you can see there are all kinds of travel clocks available, so there is bound to be one out there that is right for you. thanks for all the reviews on these products. We personally use a light clock similar to the first example. We have never missed a bus. You?re the one with the branis here. I?m watching for your posts.